On the left-hand side of the page click Folders to display your project's folders. Locate your folder and click on the folder's name. 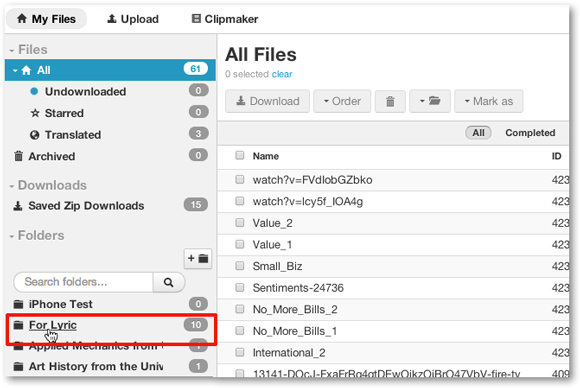 Click Folder Actions located above your list of files. Next click Download Folder from the drop=down menu. Check the boxes besides the formats you want your files saved as to your computer. After selecting your formats, click Next. If you have previously configured your Favorite Formats they will already be selected by default. Deselect the formats you don't need or add additional formats you want for this batch download. See more information on configuring your Favorite Formats. Advanced settings will only be available when formats using SMPTE timecode e.g., SCC or STL captions. 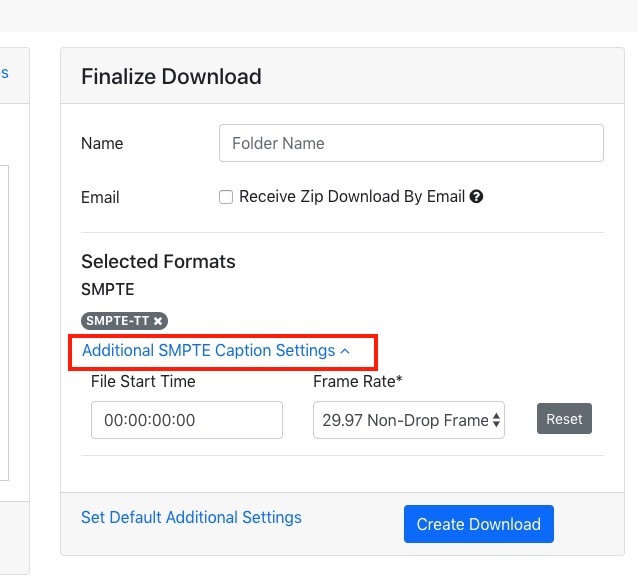 If advanced settings like starting timecode, framerate, or DF vs NDF are configured on this page they will only apply to SMPTE formats when saved to your computer. Non-SMPTE formats like SRT and transcripts files will not be affected. If there is nothing available to configure click Next. If there are SMPTE configurations available please set feel to set these before proceeding. 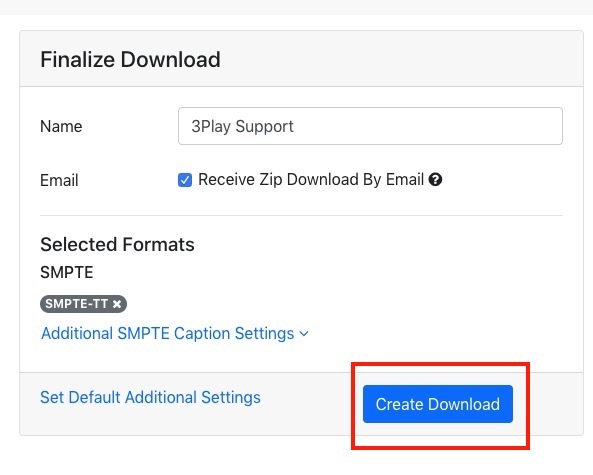 Please note that any settings applied to this download does not permanently alter the master file that is stored indefinitely in the 3Play Media account. Only the versions downloaded will have these configurations applied! Configure your Email Notifications for this request. By default an email will be sent to the requester containing a link to download the .zip folder directly from the email. To opt out of this notification select Do not send me an email. I will download the zip folder from the Downloads section of My Files. When ready click Create Download to start processing your files in the requested formats. After clicking Create Download you will be directed to to the Saved Downloads page. The request will be listed under the Processing tab. The zip folder will be listed under Completed when it is available to be downloaded to your computer. From the Completed page click on the name of the .zip folder to download it to your computer. Please note: The time for the folder to become available under Completed will vary depending on the amount of files and formats requested.